They are no longer common on all our shores. They come in a wide variety of colours and knob patterns. They use water to pump up their bodies. Don't remove them from water for too long. Where seen? 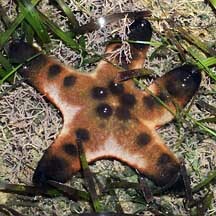 This huge and colourful sea star is sometimes seen on Chek Jawa and some of our undisturbed Northern and Southern Shores. 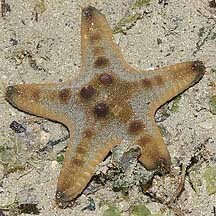 Adults are usually seen in coral rubble areas, alone or widely spaced apart. 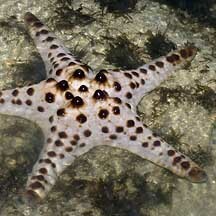 These spectacular animals are the highlight of a shore trip! 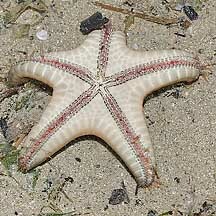 Features: Diameter with arms, adults to 30cm, juveniles 8-15cm. Hard, heavy body that is calcified. Arms long tapering to rounded tip, thick and triangular in cross-section. Although their arms appear stiff, these can bend quite extensively. 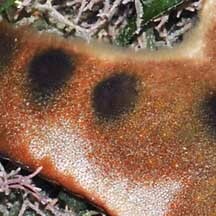 When submerged tiny transparent finger-like structures (papulae) might be seen on the upperside. 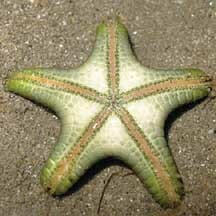 This species is generally identified by the single row of knobs along the upperside of the arms. The shape, colour and number of knobs may vary. 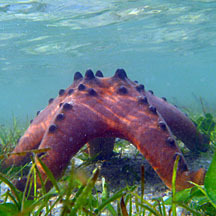 Underneath, from grooves under the arms, emerge tube feet with sucker-shaped tips. 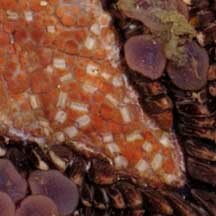 These tube feet can be bright red or purple! 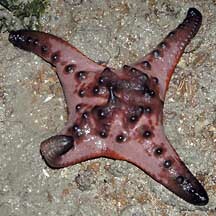 Knobbly sea stars are mostly red, orange or brown, but sometimes white or pink ones are encountered. 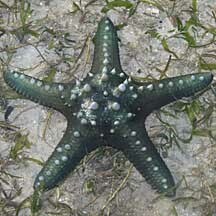 Blue or green ones are also sometimes seen. 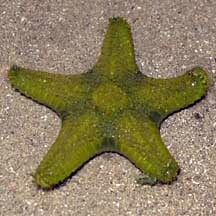 Knobbly sea stars are not venomous, although they are often brightly coloured and covered with dangerous-looking knobs, nodules and spines. 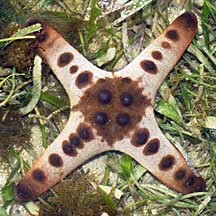 They are also called the Giant Nodulated sea star, Horned sea star or Chocolate Chip sea star. What do they eat? According to Lane, it eats micro-organisms and scavenges on dead creatures. 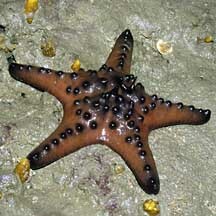 According to Gosliner, it probably feeds on sponges. 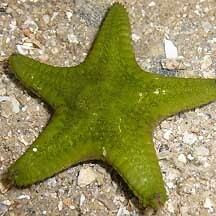 According to Schoppe, it prefers to eat clams and snails but also eats sponges, soft corals and other invertebrates. 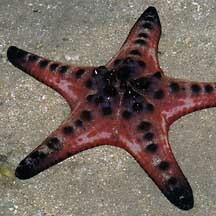 According to Coleman the sea star hosts shrimps, scale worms, harlequin crabs and sea star crabs. Others report parasitic snails as well as. 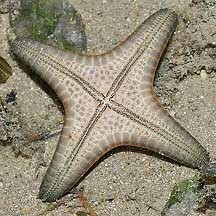 But these have not been observed on the Knobbly sea stars seen at low tide. 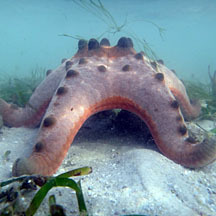 Knobbly babies: Sometimes, submerged large adults are seen standing on tip toes during a highish tide or incoming tide. They are probably getting ready to release eggs and sperm simultaneously! 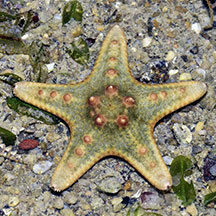 More about this spawning posture on the Echinoblog. 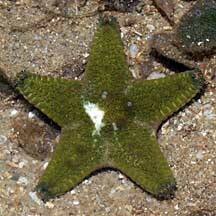 Juveniles are commonly seen on Cyrene Reef among seagrasses, as well as some of our other shores. 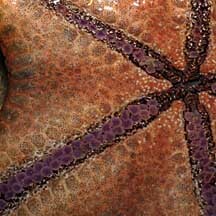 Status and threats: Knobbly sea stars are harvested from the wild for the live aquarium trade, often selling for only a few dollars. In captivity, they are unlikely to survive long without expert care. 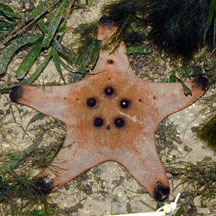 In the past, Knobbly sea stars were among the most common large sea stars of Malaya. 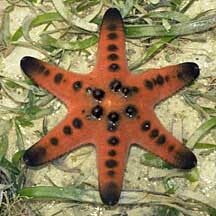 They are now listed as 'Endangered' on the Red List of threatened animals of Singapore. 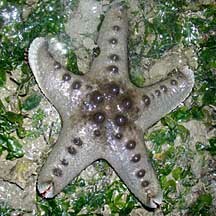 Cyrene Reef is among the few places left in Singapore where they can be seen regularly. 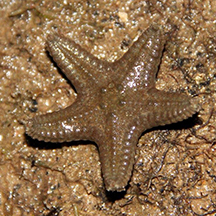 Tiny pedicellaria near the mouth. 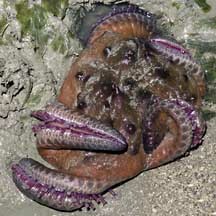 Pink or purple tube feet. Without knobs on the arms! Photo shared by Marcus Ng on flickr. Sometimes seen in contorted shapes. Photo shared by Loh Kok Sheng on his blog. Photo shared by Loh Kok Sheng on flickr. Photo shared by James Koh on his blog. Photo shared by Neo Mei Lin on her blog. Photo shared by Toh Chay Hoon on her flickr. 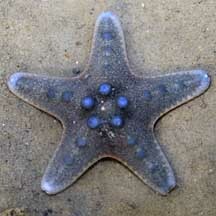 With grateful thanks to Chim Chee Kong of the Star Trackers for identifying the sea stars. 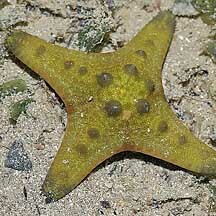 The Star Trackers blog all about the Knobbly sea stars of Singapore! 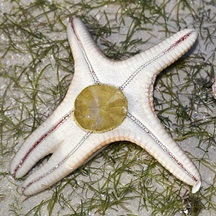 Protoreaster nodosus (Valvatida: Oreasteridae) Knobbly Sea Star by Chiu Po Wei Diana, 2011 on taxo4254. 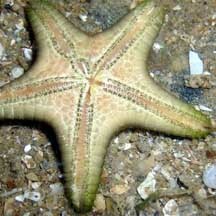 Starfish conservation: Protoreaster nodosus on The Echinoblog: about the status of the Knobbly sea star. Didier VandenSpiegel et al. 1998. 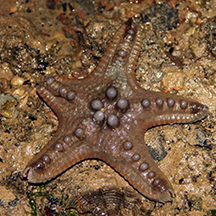 The Asteroid fauna (Echinodermata) of Singapore with a distribution table and illustrated identification to the species. The Raffles Bulletin of Zoology 1998 46(2): 431-470. Gosliner, Terrence M., David W. Behrens and Gary C. Williams. 1996. 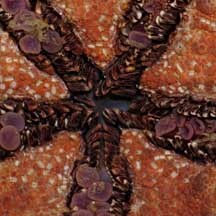 Coral Reef Animals of the Indo-Pacific: Animal life from Africa to Hawai'i exclusive of the vertebrates Sea Challengers. 314pp.